The songs of George Gershwin (1898-1937) are among the most popular and celebrated in the American Songbook. A son of Russian Jewish immigrants who settled in Brooklyn, Gershwin became the ultimate American popular musician. He blended and manipulated musical forms such as jazz, early blues and classical music into the popular song idioms of his time and thereby forged a distinctly American style of music, influencing every American songwriter since, including Leonard Bernstein, who we are honoring this year at the festival. 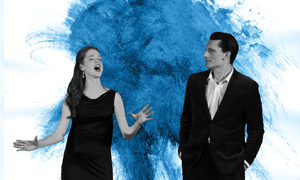 This concert by the nationally-acclaimed Crested Butte Opera Studio features some of Gershwin’s most popular songs from Broadway and Hollywood, many written in collaboration with the composer’s brother, Ira, whose lyrics crackle with puns and wry wit, and share acclaim with his brother’s captivating melodies. On the program are such beloved songs as “Someone to Watch Over Me,” “I Got Rhythm,” “The Man I Love,” “Let’s Call the Whole Thing Off,” “Nice Work if You Can Get It,” “Embraceable You,” “How Long Has This Been Going On?,” “They Can’t Take That Away From Me,” and “Lady, Be Good,” as well as some rediscovered comedic gems such as “Naughty Baby” and “Vodka.” Gershwin’s untimely death underscores his prodigious compositional output and importance to the American popular song catalog. He once said, “True music must reflect the thought and aspirations of the people and time. My people are Americans. My time is today.” This is as true in 2018 as it was a hundred years ago.